Every time someone says e-learning in Zimbabwe the talk almost always veers towards the way traditional learning content specific to writing and mathematics has been transferred to digital platforms. That is what we have seen from most local attempts (think EcoSchool, e-Learning Solutions or Big Brain) aimed at servicing this growing market which in all fairness is open to a lot more ideas and approaches. An area easily overlooked though is tutorship for verbal skills and reading local languages, which is something that guys like Shona Ndebele Tutor have been doing. Now a startup called NatiV is out to address the same problem albeit with a different approach. A couple of years ago Ian Mutamiri, an Engineer (and part-time music producer) who had enrolled for a Masters program at the University of Zimbabwe started research on the creation of affordable and convenient mobile technology to curb the shortages of teachers in rural areas. His focus turned to language learning which embodied his love for sound and technology. With help from Dr Brooking (an Engineer formerly with the UZ) and Dr Mugari this project eventually narrowed its focus towards the teaching of native languages to Zimbabwean children. The problem that had been identified was the absence of modern digital tools and apps that preserve local native languages, assist children with learning disabilities and make learning fun and engaging. 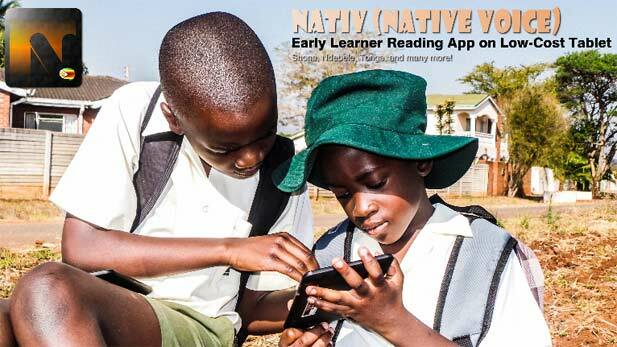 The solution created for this was the NatiV Android application which is set for official launch in March this year and has been going through a pilot run at a learning centre in Old Marimba Park, Harare called St Perez. Official download hasn’t been extended to the general public but people keen on trying it out can sign up on the mailing list to get notifications on when it will be available. Mutamiri has been working at this centre together with Jayden Shamhu, Brighton Mukorera, and Tinashe Mutiwanyuka (who is in the UK) to handle the technical aspects of the app. Other people involved with the app include Chipo Mkandla and Saewyd Mutiwanyuka. The project has been bootstrapped from its inception with hopes of deriving financial sustainability after launch through tutorials delivered at St Perez and other learning centres that they can extend the service to. In 2013 NatiV managed to get $10,000 in seed funding from the Fund for Internet Research (FIRE) and AFRINIC. This provided the resources necessary for the acquisition of low end tablets that are being used by the group of 30 pupils in the app’s pilot run. So far the feedback that NatiV has received has been growing and it is largely positive, something that was also spurned on by being shortlisted for the UK’s Royal Academy of Engineering Africa Prize for Engineering Innovation. Ian Mutamiri admits their team has a lot of work to do in the coming year in addition to the search for more funding. After the launch they are exploring the expansion of the app’s language scope which starts off with Ndebele phonetics, something that is almost done. Other languages like Tonga are also on the way with an iOS app also in the works.